The centerpiece of President Trump’s tax plan is a 15 percent corporate tax rate. Republicans in Congress aren’t quite as aggressive. The House GOP plan envisions a 20 percent corporate tax rate, while Senate Republicans have yet to coalesce around a specific plan. Notwithstanding the absence of a unified approach, you would think that the stage is set for a big reduction in America’s anti-competitive corporate tax rate, which is the highest in the developed world (if not the entire world) and creates big disadvantages for American workers and companies. While I am hopeful something will happen, there are lots of potential pitfalls, including the “border-adjustable tax” in the House plan. This risky revenue-raiser has created needless opposition from major segments of the business community and could sabotage the entire process. And I also worry that momentum for tax cuts and tax reform will erode if Trump doesn’t get serious about spending restraint. What makes this especially frustrating is that so many other nations have successfully slashed their corporate tax rates and the results are uniformly positive. My colleague Chris Edwards recently shared the findings from an illuminating study published by the London-based Centre for Policy Studies. It examines what’s happened in the United Kingdom as the corporate tax rates has dropped from 35 percent to 20 percent over the past 30 years. Here’s some of what Chris wrote about this report. And keep in mind that GDP today is significantly greater in part because of a better corporate tax system. Here’s the chart from the CPS study, showing the results over the past three decades. The results from the most-recent round of corporate rate cuts are especially strong. In 2010-11, the government collected £36.2 billion from a 28 percent corporate tax. The government expected its corporate tax package—including a rate cut to 20 percent—to lose £7.9 billion a year by 2015-16 on a static basis. …But that analysis was apparently too pessimistic: actual revenues in 2015-16 had risen to £43.9 billion. So in five years, the statutory tax rate fell 29 percent (28 percent to 20 percent) but revenues increased 21 percent (£36.2 billion to £43.9 billion). That is dynamic! None of this should be a surprise. Big reductions in the Irish corporate tax rate also led to an uptick in corporate receipts as a share of economic output. And remember that the economy has boomed, so the Irish government is collecting a bigger slice of a much bigger pie. And Canadian corporate tax cuts generated the same effect, with no drop in revenues even though (or perhaps because) the federal tax rate on business has plummeted to 15 percent. Would we get similar results in the United States? According to experts, the answer is yes. Scholars at the American Enterprise Institute estimate that the revenue-maximizing corporate tax rate for the United States is about 25 percent. And Tax Foundation experts calculate that the revenue-maximizing rate even lower, down around 15 percent. I’d be satisfied (temporarily) if we split the difference between those two estimates and cut the rate to 20 percent. Let’s close with some dare-to-hope speculation from Joseph Sternberg of the Wall Street Journal about what might happen in Europe if Trump significantly drops the U.S. corporate tax rate. Donald Trump says many things that alarm Europeans, but one of the bigger fright lines may have come in last week’s address to Congress: “Right now, American companies are taxed at one of the highest rates anywhere in the world. My economic team is developing historic tax reform that will reduce the tax rate on our companies so they can compete and thrive anywhere and with anyone.” What’s scary here to European ears is…the idea that tax policy is now fair game when it comes to global competitiveness. …One of the biggest political gifts Barack Obama gave European leaders was support for their notion that low tax rates are unfair and that taxpayers who benefit from them are somehow crooked. Europeans pushed that line among themselves for years, complaining about low Irish corporate rates, for instance. The taboo on tax competition is central to the political economy of Europe’s welfare states… Mr. Obama…backed global efforts against “base erosion and profit shifting,” meaning legal and efficient corporate tax planning. The goal was to obstruct competition among governments… The question now is how much longer Europe could resist widespread tax reform if Mr. Trump brings in a 20% corporate rate alongside rapid deregulation—or what the consequences will be in terms of social-spending trade-offs to a new round of tax cutting. Dare to dream that Mr. Trump manages to trigger a new debate about competitiveness in Europe. Amen. I’m a huge fan of tax competition because it pressures politicians to do the right thing even though they would prefer bad policy. And I also like the dig at the OECD’s anti-growth “BEPS” initiative. P.S. I want government to collect less revenue and spend less money, so the fact that a lower corporate tax rate might boost revenue is not a selling point. Instead, it simply tells us that the rate should be further reduced. Remember, it’s a bad idea to be at the revenue-maximizing point on the Laffer Curve (though that’s better than being on the downward-sloping side of the Curve, which is insanely self-destructive). Working the world of public policy, I’m used to surreal moments. Such as the assertion that there are trillions of dollars of spending cuts in plans that actually increase spending. How do you have a debate with people who don’t understand math? Or the oft-repeated myth that the Reagan tax cuts for the rich starved the government of revenue. How can you have a rational discussion with people who don’t believe IRS data? And let’s not overlook my personal favorite, which is blaming so-called tax havens for the financial crisis, even though places such as the Cayman Islands had nothing to do with the Fed’s easy-money policy or with Fannie Mae and Freddie Mac subsidies. These are all example of why my hair is turning gray. But I’ll soon have white hair based on having to deal with the new claim from European bureaucrats that countries are guilty of providing subsidies if they have low taxes for companies. I’m not joking. This is basically what’s behind the big tax fight between Apple, Ireland, and the European Commission. Here’s what I said about this issue yesterday. There are three things about this interview are worth highlighting. First, the European Commission is motivated by a desire for more tax revenue. Disappointing, but hardly surprising. Second, Ireland has benefited immensely from low-tax policies and that’s something that should be emulated rather than punished. Third, I hope Ireland will respond with a big corporate tax cut, just as they did when their low-tax policies were first attacked many years ago. I also chatted with the folks from the BBC. I’ll add a few comments on this interview as well. First, to the extent that the European Commission wants to interfere with fiscal policy in member states, it should urge spending caps for profligate welfare states. Second, since it’s been in bed with the Europeans on schemes to boost business taxation, the US government can’t throw stones since it lives in a glass house. Third, our friends on the left are terrified of a “race to the bottom” but their real motive seems to be a desire for more money to prop up big welfare states. Here’s an interview from the morning, which was conducted by phone since I didn’t want to interrupt my much-needed beauty sleep by getting to the studio at the crack of dawn. Once again, here are a few follow-up observations. First, I realize I’m being repetitive, but it’s truly bizarre that the European Commission thinks that low taxes are a subsidy. This is the left-wing ideology that the government has first claim on all income. Second, it’s a wonky point, but Europe’s high-tax nations can use transfer pricing rules if they think that Apple (or other companies) are trying to artificially shift income to low-tax countries like Ireland. Third, the U.S. obviously needs to reform its wretched corporate tax system, but that won’t solve this problem since it’s about an effort to impose more tax on Apple’s foreign-source income. The Wall Street Journal opined wisely on this issue, starting with the European Commission’s galling decision to use anti-trust laws to justify the bizarre assertion that low taxes are akin to a business subsidy. Even by the usual Brussels standards of economic malpractice, Tuesday’s €13 billion ($14.5 billion) tax assault on Apple is something to behold. …Apple paid all the taxes it owed under existing tax laws around the world, which is why it hasn’t been subject to enforcement proceedings by revenue authorities. …Brussels now wants to use antitrust law to tell Ireland and other low-tax countries how to apply their own tax laws. …Brussels is deploying its antitrust gnomes to claim that taxes that are “too low” are an illegal subsidy under EU state-aid rules. This is amazing. A subsidy is when government officials use coercion to force taxpayers (or consumers) to pay more in order to line the pockets of a company or industry. The Export-Import Bank would be an example of this odious practice, as would ethanol handouts. Choosing to tax at a lower rate is not in this category. It’s a reduction in government coercion. That doesn’t necessarily mean we’re necessarily talking about good policy since there are plenty of preferential tax laws that should be wiped out as part of a shift to a simple and fair flat tax. The WSJ also points out that it’s not uncommon for major companies to seek clarification rulings from tax authorities. Brussels points to correspondence between Irish tax officials and Apple executives to claim that Apple enjoyed favors not available to other companies, which would be tantamount to a subsidy. But all Apple received from Dublin, in 1991 and 2007, were letters confirming how the tax authorities would treat various transactions under the Irish laws that applied to everyone. If anyone in Brussels knew more about tax law, they’d realize such “comfort letters” are common practice around the world. Indeed, the IRS routinely approves “advance pricing agreements” with major American taxpayers. This doesn’t mean, by the way, that governments (the U.S., Ireland, or others) treat all transactions appropriately. But it does mean that Ireland isn’t doing something strange or radical. The editorial also makes the much-needed point that the Obama White House and Treasury Department are hardly in a position to grouse, particularly because of the demagoguery and rule-twisting that have been used to discourage corporate inversions. As for the U.S., the Treasury Department pushed back against these tax cases, which it rightly views as a protectionist threat to the rule of law. But it’s hard to believe that Brussels would have pulled this stunt if Treasury enjoyed the global respect it once did. President Obama and Treasury Secretary Jack Lew have also contributed to the antibusiness political mood by assailing American companies for moving to low-tax countries. It’s also worth noting that the Obama Administration has been supportive of the OECD’s BEPS initiative, which also is designed to increase corporate tax burdens and clearly will disadvantage US companies. 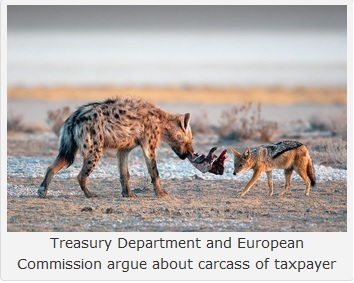 A story from the Associated Press reveals the European Commission’s real motive. The European Commission says…it should help protect countries from unfair tax competition. When one country’s tax policy hurts a neighbor’s revenues, that country should be able to protect its tax base. Wow, think about what this implies. We all recognize, as consumers, the benefits of having lots of restaurants competing for our business. Or several cell phone companies. Or lots of firms that make washing machines. Competition helps us by leading to lower prices, higher quality, and better service. And it also boosts the overall economy because of the pressure to utilize resources more efficiently and productively. So why, then, should the European Commission be working to protect governments from competition? Why is it bad for a country with low tax rates to attract jobs and investment from nations with high tax rates? The answer, needless to say, is that tax competition is a good thing. Ever since the Reagan and Thatcher tax cuts got the process started, there have been major global reductions in tax rates, both for households and businesses, as governments have competed with each other (sadly, the US has fallen way behind in the contest for good business taxation). 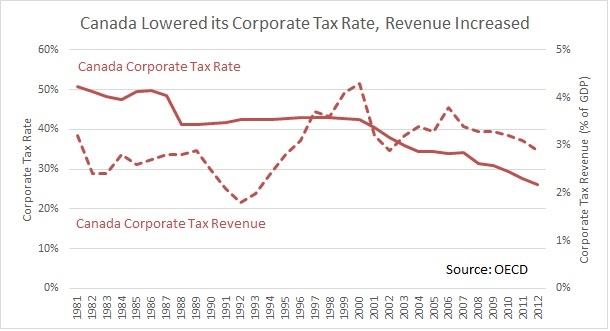 Politicians understandably don’t like this liberalizing process, but the tax competition-induced drop in tax rates is one of the reason why the stagflation of the 1960s and 1970s was replaced by comparatively strong growth in the 1980s and 1990s. Let’s close by looking at one final story. Bloomberg has a report on the Apple-Ireland-EC controversy. Here are some relevant passages. Irish Finance Minister Michael Noonan on Tuesday vowed to fight a European Commission ruling… The country’s corporate tax regime is a cornerstone of its economic policy, attracting Google Inc. and Facebook Inc. to Dublin. …While the Apple ruling doesn’t directly threaten the 12.5 percent rate, the government has promised to stand by executives it says are helping the economy. “To do anything else, it would be like eating the seed potatoes,” Noonan told broadcaster RTE on Tuesday, adding a failure to fight the case would hurt future generations. Kudos to Noonan for understanding that a short-term grab for more revenue will be bad news if the tradeoff is a more onerous tax system that reduces future growth. I wish Hillary Clinton was capable of learning the same lesson. Also, it’s worth noting that Apple is just the tip of the iceberg. If the EC succeeds, many other American companies will be under the gun. The iPhone-maker is one of more than 700 U.S. companies that have units there, employing a combined 140,000 people, according to the American Chamber of Commerce in Ireland. And when politicians – either here or overseas – raise taxes on companies, never forget that they’re actually raising taxes on worker, consumers, and shareholders. P.S. Just in case you think the Obama Administration is sincere about defending Apple and other American companies, don’t forget that these are the folks who included a global corporate minimum tax scheme in the President’s most recent budget. But in the real world, that seems to be the exception rather than the rule. There’s an interesting and informative article at the St. Louis Federal Reserve Bank which explores this question. It asks why most low-income and middle-income nations are not “converging” with countries from the developed world. …only a few countries have been able to catch up with the high per capita income levels of the developed world and stay there. By American living standards (as representative of the developed world), most developing countries since 1960 have remained or been “trapped” at a constant low-income level relative to the U.S. This “low- or middle-income trap” phenomenon raises concern about the validity of the neoclassical growth theory, which predicts global economic convergence. Specifically, the Solow growth model suggests that income levels in poor economies will grow relatively faster than developed nations and eventually converge or catch up to these economies through capital accumulation… But, with just a few exceptions, that is not happening. Here’s a chart showing examples of nations that are – and aren’t – converging with the United States. The authors analyze this data. The figure above shows the rapid and persistent relative income growth (convergence) seen in Hong Kong, Singapore, Taiwan and Ireland beginning in the late 1960s all through the early 2000s to catch up or converge to the higher level of per capita income in the U.S. …In sharp contrast, per capita income relative to the U.S. remained constant and stagnant at 10 percent to 30 percent of U.S. income in the group of Latin American countries, which remained stuck in the middle-income trap and showed no sign of convergence to higher income levels… The lack of convergence is even more striking among low-income countries. Countries such as Bangladesh, El Salvador, Mozambique and Niger are stuck in a poverty trap, where their relative per capita income is constant and stagnant at or below 5 percent of the U.S. level. The article concludes by asking why some nations converge and others don’t. Why do some countries remain stagnant in relative income levels while some others are able to continue growing faster than the frontier nations to achieve convergence? Is it caused by institutions, geographic locations or smart industrial policies? I’ll offer my answer to this question, though it doesn’t require any special insight. Simply stated, Solow’s Growth Theory is correct, but needs to be augmented. Yes, nations should converge, but that won’t happen unless they have similar economic policies. And if relatively poor nations want to converge in the right direction, that means they should liberalize their economies by shrinking government and reducing intervention. Take a second look at the above chart above and ask whether there’s a commonality for the jurisdictions that are converging with the United States? Why have Hong Kong, Singapore, Taiwan, and Ireland converged, while nations such as Mexico and Brazil remained flat? The obvious answer is that the former group of jurisdictions have pursued, at least to some extent, pro-market policies. 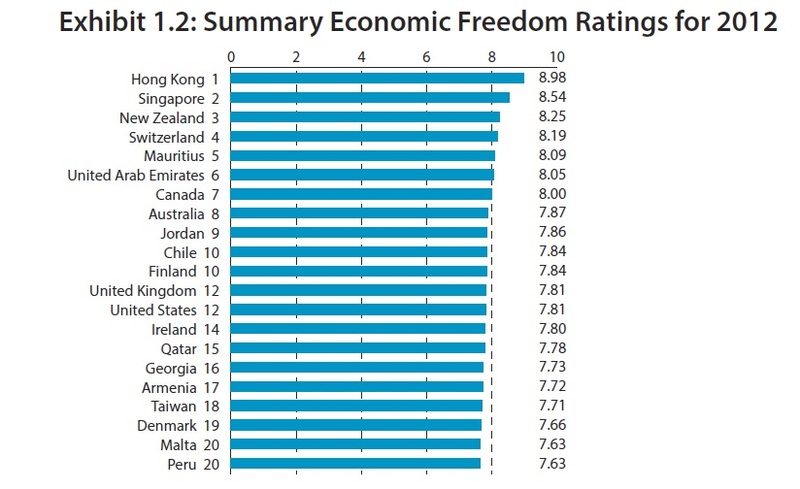 Heck, they all rank among the world’s top-18 nations for economic freedom. Hong Kong and Singapore have been role models for economic liberty for several decades, so it’s no surprise that their living standards have enjoyed the most impressive increase. But if you dig into the data, you’ll also see that Taiwan’s jump began when it boosted economic freedom beginning in the late 1970s. And Ireland’s golden years began when it increased economic freedom beginning in the late 1980s. The moral of the story is – or at least should be – very clear. Free markets and small government are the route to convergence. And if you want some real-world examples of how nations with good policy “de-converge” from nations with bad policy, here’s a partial list. Gee, it’s almost enough to make you think there’s a relationship between good long-run growth and economic freedom! As the old saying goes, I couldn’t have said it better myself. Too many politicians and interest groups want us to believe that foreign aid and bigger government are the answer, but nations that have jumped from poverty to prosperity invariably have followed a path of free markets and small government. But today’s topic isn’t foreign aid. Instead, I want to come to Bono’s aid. He recently defended his home country’s favorable corporate tax regime. Here are some excerpts from a report earlier this month in the Irish Times. So why does Bono need defending? Because bosses from the leading Irish labor union apparently think he said something very bad. Here are some excerpts from a story published by the U.K-based Guardian. First, I wonder whether the union is comprised mostly of private-sector workers or government bureaucrats. This may be relevant because I hope that private-sector union workers at least have a vague understanding that their jobs are tied to the overall prosperity of the economy. But if Unite is dominated by government bureaucrats, then it’s no surprise that it favors class-warfare policies that would cripple the private sector. Second, the union bosses are right that Ireland has been suffering in the past six years, but they apparently don’t realize that the nation’s economy stumbled because government was getting bigger and intervening too much. Third, maybe it’s true that “one in four” in Ireland currently suffer from “deprivation,” but that number has to be far smaller than it was thirty years ago. 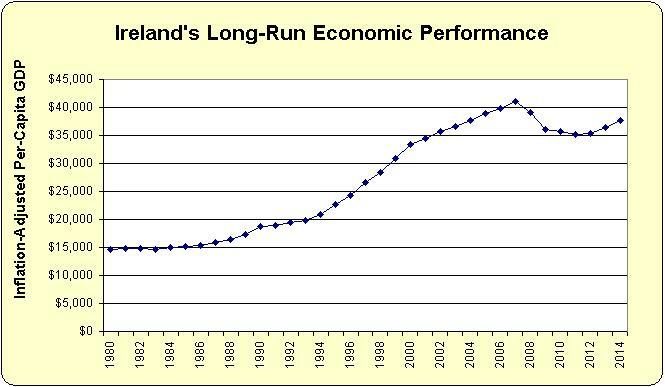 Here’s a chart, based on IMF data, showing per-capita economic output in Ireland. As you can see, per-capita GDP has jumped from $15,000 to more than $37,500. And these numbers are adjusted for inflation! I gave some details back in 2011 when I had the opportunity to criticize another Irish leftist who was blithely ignorant of Ireland’s big improvements in living standards once it entered into its pro-market reform phase. I don’t know how the folks at Unite define progress, but I assume it’s good news that the Irish people now have more car, more phones, more doctors, more central heating, and fewer infant deaths. Last but not least, none of this should be interpreted as approval of Ireland’s current government or overall Irish policy. There’s too much cronyism in Ireland and the overall fiscal burden (other than the corporate income tax) is onerous. I’m simply saying that Bono is right. Pro-growth corporate tax policy has made a big – and positive – difference for Ireland. The folks at Unite should learn a lesson from the former President of Brazil, who was a leftist but at least understood that you need people in the private sector producing if you want anything to redistribute. P.P.S. Irish politicians may understand the importance of keeping a low corporate tax rate, but they certainly aren’t philosophically consistent when it comes to other taxes. P.P.P.S. Some statists have tried to blame Ireland’s recent woes on the low corporate tax rate. More sober analysis shows that imprudent spending hikes and misguided bailouts deserve the blame (Ireland’s spending is particularly unfortunate since the nation’s period of prosperity began with spending restraint in the late 1980s).